The extremely durable Larson Electronics HALSS-TRN-1000W-MH metal halide hazardous area light produces exceptional illumination from a 1000 watt metal halide lamp. Constructed of corrosion resistant stainless steel and U.L. listed for marine use, this fixture is a versatile and ideal hazardous area lighting solution for areas where wet or corrosive environments are encountered. The rugged HALSS-TRN-1000W-MH metal halide fixture is weatherproof and suitable for use in wet, outdoor and marine environments making it an ideal lighting solution for industrial applications, boat docks, building exteriors and outdoor work areas. The lamp housing is weatherproof and constructed of stainless steel, featuring a removable front-access door with captive closure screws for easy servicing. The optical assembly includes heat/impact-resistant tempered door glass with a stainless steel door frame and heavy duty, high temperature silicone rubber seal. The lamp socket is a specification grade mogul base porcelain unit with heavy gauge brass, a nickel-plated, double lamp-grip screw shell and spring-loaded center contact. This compact hazardous area light is U.L. rated 844, 2279 Class 1 Division 2, Groups A,B,C,D and U.L. 1598A listed for outdoor salt water marine environments. 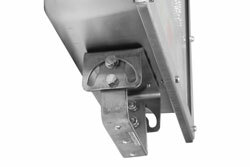 The integral pulse start ballast is protected within the weatherproof housing and has primary electrical taps for 120V, 208V, 240V, and 277V. 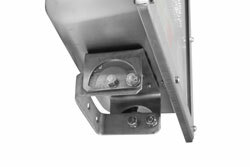 This fixture is suitable for use in areas where flammable petrochemical vapors are sometimes present. The heavy duty design of this fixture makes it a good choice for outdoor applications regardless of whether the locations are designated hazardous or not. This light is highly durable, produces high light output in a wide flood pattern and operates effectively at higher temperatures. 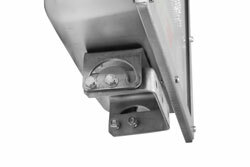 Mounting is via an adjustable stainless steel trunnion bracket that allows the fixture to be attached to walls or ceilings and provides secure adjustment and positioning. All hardware on this unit is corrosion resistant stainless steel making it resistant to rain, snow, salt water and corrosive chemicals. Lamps for this fixture are available at an additional cost. LAMPS: Use only lamps specified on nameplate. Bulb not included with fixture. Observe lamp manufacturer’s recommendations and restrictions on lamp operation, particularly ballast type, burning position, etc. Make all electrical connections in accordance with the National Electrical Code and any applicable local code requirements. Verify that supply voltage is correct by comparing it to nameplate. Three-conductor No. 14 cable (with 90° C minimum insulation) is recommended for making electrical connections. Wiring is accomplished through the wiring box provided on the fixture. The box is provided with a size 3/4-in. NPT threaded conduit opening. Wiring methods must comply with NFPA 70 (The National Electrical Code), Article 501 for Class I, Division 2 Hazardous (Classified) Locations. 1. High Pressure Sodium Lamp. 3. Rugged Stainless Steel Housing. 4. Flat Glass Lens Door with Captive Screws - Tempered Glass. 5. Heavy Duty Door Gasket. 6. Socket: Mogul Base heavy gauge brass, nickel-plated double lamp-grip screw shell. 8. Adjustable Trunnion Bracket Mount- Corrosion Resistant. 9. Heavy Duty High heat silicone Door Glass Seal. 10. Effective at higher temperatures. While LEDs are still making inroads into high bay applications, fluorescent and HID systems already have a proven track record of effectiveness, providing an extra degree of security for those as yet unprepared to make the jump to solid state lighting. Follow along as we look at some of the improvements traditional high bay systems have undergone and how this affects their overall performance.